Pure PTFE Gasket is molded or skived or cut from virgin PTFE stick, pipe and sheet into flat shape, V shape gasket or valve annulus. It has 100% PTFE structure and has characteristics of high-temperature-proof, strong-corrosion-proof and clean. PTFE envelope gasket is a kind of static seals. It is composed of elastic materials such as compressed asbestos sheet, rubber, ceramics, etc. and PTFE envelope cover. 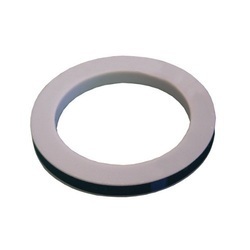 We offer PTFE Enveloped Gasket upto 1000 mm ID. These gaskets are used in Reactor Manhole for packing. Our range of PTFE (Teflon®)Lanco Pipes And Fittings PTFE Envelope Gaskets and Expanded PTFE Sheet Gaskets / Joint Sealants. We are successfully meeting the varied requirements of our clients by providing the best quality range of PTFE Envelope Gasket.